Sustained drug-release in the SFA drives superior results. Coronary drug-eluting stents (DES) with both paclitaxel and limus drugs have demonstrated successful long-term clinical outcomes for patients, with single-digit reintervention rates at 1 year. While the limus family of drugs have been particularly successful in coronary stenting, two major clinical trials studying limus-eluting stents in the superficial femoral artery (SFA) failed to show clinical efficacy. The SIROCCO study evaluated a sirolimus-eluting version of the SMART stent (Cordis, a Cardinal Health company),1 and the STRIDES study evaluated an everolimus-eluting version of the Dynalink stent (Abbott Vascular).2 Neither study was able to show a statistically significant difference between the limus-eluting stents and their respective bare-metal counterparts. Unlike disease in the coronary arteries, where restenosis usually peaks within 3 to 6 months, restenosis tends to peak later in the SFAs, usually between 9 to 12 months. The experience with peripheral first-generation nitinol BMS was disappointing, with 1-year primary patency rates well below 80%, far less than patency rates observed in the coronary arteries. Figure 1. Comparison of drug release over time between Zilver PTX, DCBs, and Eluvia. Eluvia is designed to sustain drug release to match when restenosis peaks in the SFA. With the design of the Eluvia Drug-Eluting Stent System, Boston Scientific sought to improve upon existing clinical outcomes, targeting low single-digit reintervention rates and more durable long-term outcomes for patients. The Eluvia Drug-Eluting Stent represents a novel approach to the treatment of diseased femoropopliteal arteries as the first and only technology designed to sustain drug release beyond 1 year to match the restenotic process in the SFA (Figure 1). The stent platform is designed to withstand the mechanical forces of the SFA, balancing optimal strength and fracture resistance, while providing a uniform scaffolding for drug delivery. The polymer is a fluorinated polymer, which was intentionally designed to deliver optimized drug transfer with the lowest possible drug dose. The paclitaxel release is highly targeted to the lesion with virtually no drug lost downstream. Its safety has been studied in over 100,000 patients in clinical trials and implanted in over 20 million vessels commercially.10 The polymer allows the 0.167 µg/mm2 paclitaxel dose drug delivery to be tuned to sustain drug release beyond 1 year. The IMPERIAL trial represents the first head-to-head trial comparing two antiproliferative stents in the SFA. The IMPERIAL randomized cohort is a global prospective single-blind multicenter randomized controlled trial comparing Boston Scientific’s Eluvia Drug-Eluting Vascular Stent to Cook Medical’s Zilver PTX drug-coated stent (2:1 randomization). The randomized cohort enrolled 465 patients across 64 sites around the world. Eligible patients had chronic, symptomatic lower limb ischemia and de novo or restenotic lesions up to 140 mm in length in the native SFA and/or proximal popliteal artery (PPA). As prespecified in the Statistical Analysis Plan, once both primary endpoints were met, a post-hoc superiority analysis could be performed. The IMPERIAL trial also included a single-arm 50-patient long lesion sub-study evaluating safety and effectiveness of Eluvia in lesions 140 to 190 mm in length (clinicaltrials.gov identifier NCT02574481). The average lesion length in the IMPERIAL randomized cohort was 87 mm in the Eluvia arm and 82 mm in the Zilver PTX arm. In the Eluvia arm, 40% of the lesions were severely calcified, 31% were total occlusions, and 84% extended into the distal portion of the SFA and/or PPA. In the Zilver PTX arm, 32% of the lesions were severely calcified, 30% were total occlusions, and 78% extended into the distal portion of the SFA and/or proximal popliteal artery. There were no statistically significant differences in terms of patient or lesion characteristics between the two study arms. Figure 2. 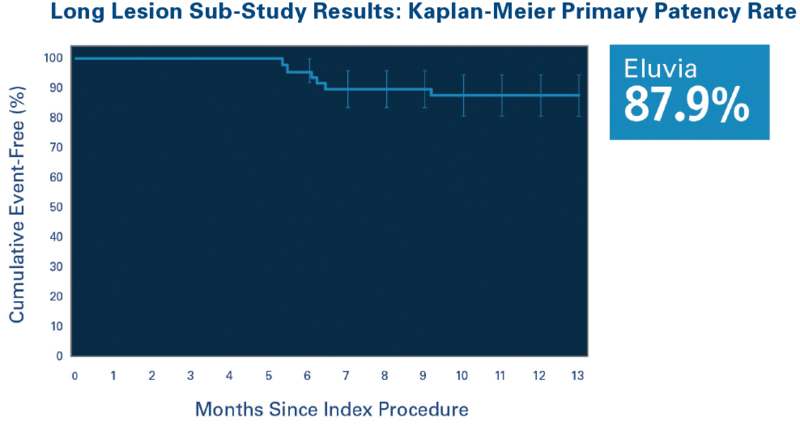 In the long lesion sub-study of the IMPERIAL trial, Eluvia demonstrated an 87.9% primary patency rate (by Kaplan-Meier estimate) in lesions with a mean length of 162.8 mm. The IMPERIAL trial is a landmark trial that advances the peripheral vascular space and provides the physician community with level 1 clinical evidence to help make clinical and device treatment decisions. It sets a new standard for clinical evidence moving forward. Antiproliferative therapies such as DESs and drug-coated balloons (DCBs) have demonstrated proven results in the SFA. We know they work. But how do we decide which therapy to use when and where? That question still needs to be answered. However, the patient populations studied in DCB trials represent primarily TASC A/B lesions, < 10 cm, and less calcification. Historical SFA stenting studies are typically inclusive of patient populations with more complex lesions and a high degree of calcification. Currently, interventionalists’ treatment algorithms typically start with vessel prep using a PTA balloon. If the result is optimal, then for shorter, simpler (TASC A and B) lesions, one might consider first-line therapy to be a DCB. If the result is suboptimal following PTA, a DES would be an appropriate treatment option. Today, technologies not only need to prove safety and efficacy, but total cost and overall value to the health care system must also be evaluated. With the progressive nature of peripheral artery disease, multiple reinterventions on the same patient becomes an expensive enterprise. Treating restenosis is often not an easy task, requiring multiple modalities depending on the location and nature of restenosis. Antiproliferative therapies greatly improve the reintervention rates not only at 12 months, but also provide durable results long-term. Balancing durable improved clinical outcomes with time spent in the lab during the procedure should be taken into consideration when evaluating the total value of a therapy. Mean procedure time for Eluvia was 57 minutes in the IMPERIAL trial. Eluvia has demonstrated consistent, reproducible results across multiple data sets in patients with claudication and critical limb ischemia, as well as short and long lesion lengths. A DES like Eluvia aims to provide patients with improved clinical outcomes and gives physicians an effective tool to help minimize costly reinterventions while keeping the procedure simple and efficient. As the lead Principal Investigator for the MAJESTIC trial and Co-Principal Investigator for IMPERIAL, what were your initial reactions to the IMPERIAL results? Prof. Müller-Hülsbeck: The results were excellent. My expectations, which were based on the encouraging 1-year data from MAJESTIC, were met for primary patency and rate of freedom from TLR. I felt somewhat relieved that a larger study population achieved excellent data with a polymer-coated DES. Why is it important for the endovascular community to have a head-to-head trial comparing two DES technologies? Prof. Müller-Hülsbeck: Having a head-to-head comparison of two available devices is something new that the interventional community has been waiting for. Comparing an established DES like Zilver PTX with the new Eluvia DES technology is outstanding, because convincing 5-year Zilver PTX data have already been published. Having more robust data from a head-to-head comparison might strengthen the acceptance of this technology in general when there is a need for an implant such as a self-expanding stent or DES. Eluvia demonstrated superiority over Zilver PTX in IMPERIAL. How should physicians performing endovascular procedures think about this superiority data when making device decisions? 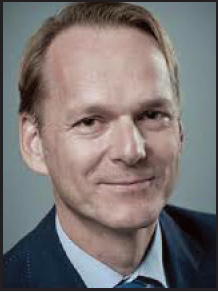 Prof. Müller-Hülsbeck: Physicians must keep in mind that all trial data are collected under ideal “trial conditions," meaning dedicated inclusion and exclusion criteria need to be fulfilled before the study device is allowed to be used; all patients are under more controlled follow-up, including stricter drug regimens; and last but not least, all participating physicians are well trained to serve as investigators in the trial. That means data are obtained under optimized conditions, which strengthens the results reached. However, statistical calculations for device safety and efficacy necessitate a minimum number of included subjects to draw any conclusions on the results, so the device performance is impressive. IMPERIAL showed that both available DES technologies provide good patient outcomes, but Eluvia performed better in terms of primary patency and 50% lower TLR rates. This might influence future decision making, meaning current Zilver PTX users may switch to Eluvia, and first-time potential users of DES technology will probably choose Eluvia from the beginning. What are your thoughts on Eluvia’s performance in IMPERIAL (88.5% primary patency), based on the very challenging lesion characteristics studied (40% severe calcium in the Eluvia arm and nearly a third chronic total occlusions)? Prof. Müller-Hülsbeck: My preference in cases that need a stent is rather clear: implant a DES, ideally Eluvia. Doing the best for our patients is the goal. Since seeing the results of the first-in-human Majestic trial, I believed that all lesions that need scaffolding should receive a DES such as Eluvia. Now seeing the results from Imperial, this vision may come true. Calcium and chronic total occlusions shouldn’t hinder us from using an Eluvia stent. “Leave nothing behind” has become a popular saying in the endovascular space. 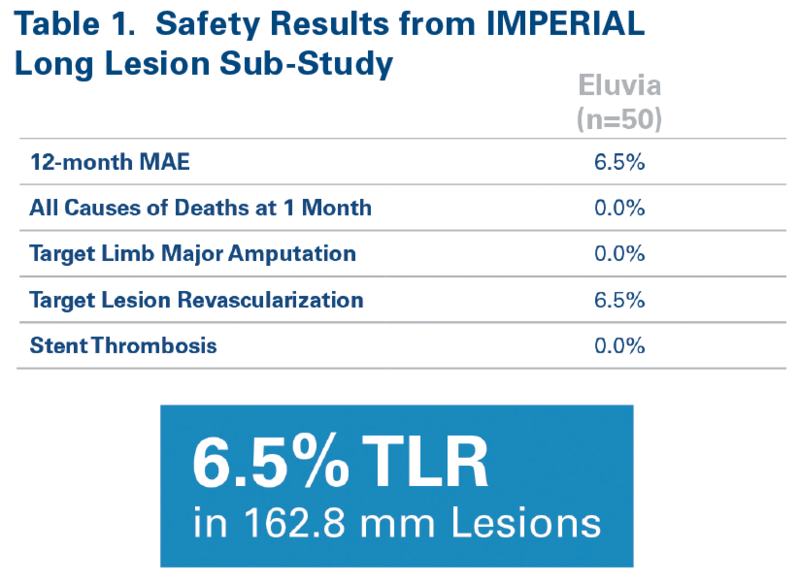 However, Eluvia demonstrated a TLR rate of just 4.5% in IMPERIAL. Do you believe that outcome could cause some physicians to rethink a leave-nothing-behind strategy, when a DES provides such excellent TLR rates? Prof. Müller-Hülsbeck: “Leave nothing behind” should still be a considered strategy, because a nitinol scaffold may not be appropriate for some patients. If a stentless strategy fails, we still have the option to implant a scaffold, or simply to repeat a leave-nothing-behind intervention. Stenting in all cases is not appropriate; however, many stents are still used because there is a strong need, and these cases should be privileged with a DES rather than a BMS. The promising results from Imperial may liberalize stent usage, but this decision will ultimately be influenced by reimbursement, which varies from country to country. How might the IMPERIAL data affect your SFA treatment algorithm moving forward? Prof. Müller-Hülsbeck: I believe that if there is a need for an implant, all implants should be DES. This may be the end of the BMS era for femoropopliteal disease treatment. 1. Duda SH, Bosiers M, Lammer J, et al. Drug-eluting and bare nitinol stents for the treatment of atherosclerotic lesions in the superficial femoral artery: long-term results from the SIROCCO trial. J Endovasc Ther. 2006;13:701–710. 2. Lammer J, Bosiers M, Zeller T, et al. First clinical trial of nitinol self-expanding everolimus-eluting stent implantation for peripheral arterial occlusive disease. J Vasc Surg. 2011;54:394–401. 3. Dake MD, Ansel GM, Jaff MR, et al. Paclitaxel-eluting stents show superiority to balloon angioplasty and bare metal stents in femoropopliteal disease: twelve-month Zilver PTX randomized study results. Circ Cardiovasc Interv. 2011;4:495-504. 4. Steiner S, Willfort-Ehringer A, Sievert H, et al. 12-month results from the first-in-human randomized study of the Ranger paclitaxel-coated balloon for femoropopliteal treatment. JACC Cardiovasc Interv. 2018;11:934-941. 5. Rosenfield K, Jaff MR, White CJ, et al. Trial of a paclitaxel-coated balloon for femoropopliteal artery disease. N Engl J Med. 2015;373:145-153. 6. Tepe G, Laird J, Schneider P, et al. Drug-coated balloon versus standard percutaneous transluminal angioplasty for the treatment of superficial femoral and popliteal artery disease: 12-month results from the IN.PACT SFA randomized trial. Circulation. 2015;131:495-502. 7. Forrester JS, Fishbein M, Helfant R, Fagin J. A paradigm for restenosis based on cell biology: clues for the development of new preventive therapies. J Am Coll Cardiol. 1991;17:758-769. 8. Zilver PTX [brochure]. PI-NAM-11365-EN-201402. Bloomington, IN: Cook Medical. 9. Dake MD, Ansel GM, Jaff MR, et al. Durable clinical effectiveness with paclitaxel-eluting stents in the femoropopliteal artery: 5-year results of the Zilver PTX randomized trial. Circulation. 2016;133:1472-1483. 10. Total global sales of the PROMUS (Boston Scientific) and XIENCE (Abbott) series of stents since 2007. Data on file at Boston Scientific Corporation. 12. Gray AW. IMPERIAL: a randomized trial of drug-eluting stents for treatment of femoropopliteal artery lesions. Presented at: 30th annual Transcatheter Cardiovascular Therapeutics (TCT) scientific symposium 2018; September 21-25, 2018; San Diego, California. 13. Gray AW. 1-year outcomes for Eluvia in long lesions: IMPERIAL long lesion substudy. Presented at: Vascular InterVentional Advances (VIVA); November 5–8, 2018; Las Vegas, Nevada. 14. Bisdas T, Beropoulis E, Argyriou A, et al. 1-year all-comers analysis of the Eluvia drug-eluting stent for long femoropopliteal lesions after suboptimal angioplasty. JACC Cardiovasc Interv. 2018;11:957-966. 15. Fanelli F, Cannavale A, Gazzetti M, et al. Calcium burden assessment and impact on drug-eluting balloons in peripheral arterial disease. Cardiovasc Intervent Radiol. 2014;37:898-907. Disclosures: Consultant to Medtronic, Boston Scientific Corporation, Gore & Associates, Abbott Vascular, Intact Vascular, Inc., Shockwave Medical, Inc., Philips, and Surmodics, Inc. Disclosures: Consultant for Boston Scientific Corporation, Terumo Europe, and Eurocor GmbH, including honoraria for travel, presentations, and workshops.